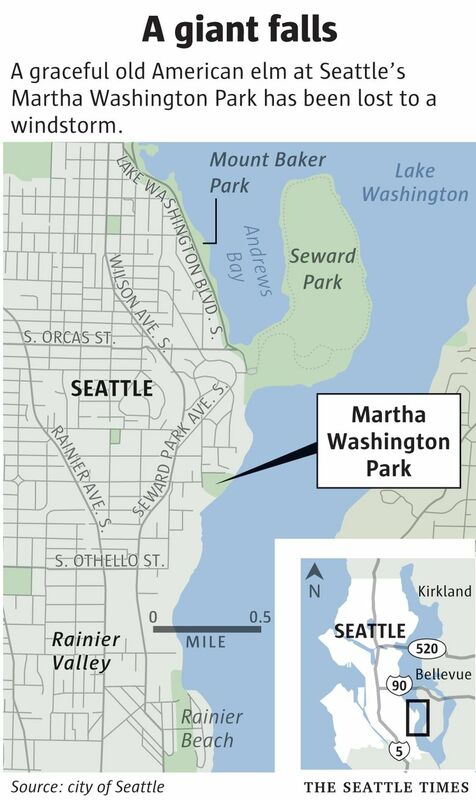 Seattle loses a treasure as a 100-year-old American elm blows down at Martha Washington Park. Few other American elms as large as this one remain in the city's parks. It stood for about a century, right at the center of this vast green sward, but a windstorm at the stub end of the year took it down, felling one of the biggest American elms left in Seattle’s city parks. Its mate, growing right next to it all that time, survives. Even alone, the tree left behind is shaped by the tree it was with for so long. Its crown on one side fits the arms’ reach of its now-absent mate. The fallen tree, No. 58 in the city’s inventory, saw so much: the Martha Washington School for Girls, for which this city park where it grew is named. The school’s eventual demolition. The daily drama overhead of crows sweeping to their nightly roost, the light on Mount Rainier and dancing blue of Lake Washington, glinting on the east and south edges of this waterfront park. 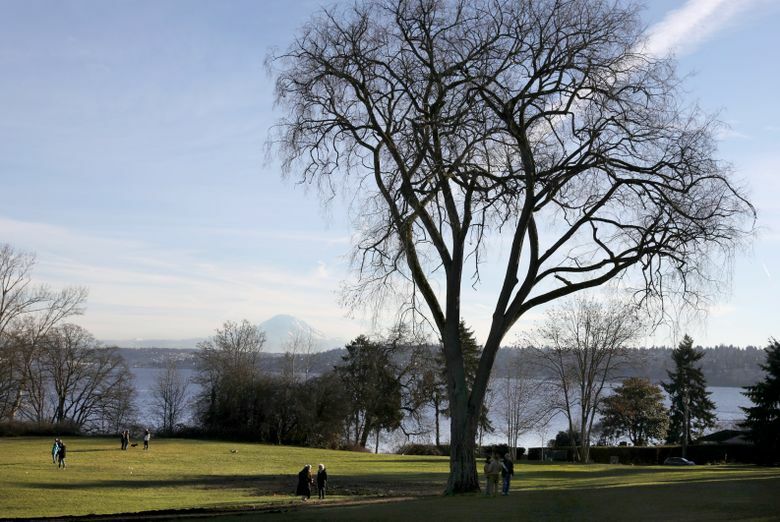 “It was a beautiful tree, and its setting was particularly spectacular,” said Deborah Brown McGarry, acting urban forest manager for Seattle Parks and Recreation. 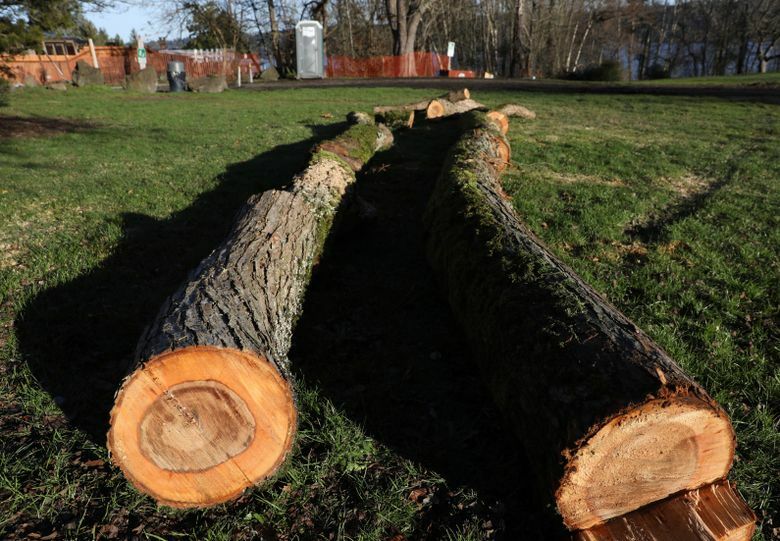 “The way it was in this pastoral meadow, leading down to Lake Washington, providing great shade, it is definitely unfortunate it failed.” A storm that blew through the night of Dec. 29 uprooted the tree. Perfectly healthy, the tree was in soil just too saturated for it to stand its ground. The city had a crew on the job that very day. The tree that took a century to grow was gone by day’s end. Cut into chunks and hauled away. Life moved right in. On a recent visit, silvery spider webs glimmered in the afternoon sun, already spun across the broken roots. Losing any big, old tree hurts, especially in a city like Seattle, where trees are cherished the more dearly as they fall to development. But big American elms also are relatively rare, survivors of the scourge of Dutch elm disease that claimed elms across the country, and many hearts with them. With their sweeping lines and perfect, vase shape, there’s nothing quite like them. Many an Elm Street across America today is planted with some other tree, once was lost the embowering shade of elms that created a quintessential main street view of small-town America. The outbreak of Dutch elm disease was initially detected in Cleveland in the 1930s — even as American plant pathologists were fighting a losing battle with chestnut blight. The disease was eventually traced to elm burls for furniture-making that had been infected, the fungus unwittingly brought to the port of Baltimore from France. By the 1980s an estimated 77 million elms were dead, Thomas Campanella writes in his book “Republic of Shade,” many of them giants that had grown into vaulted cathedrals of green. The disease was slow to arrive in Washington, but it has been killing American elms in the state since at least the 1970s. Big old American elms survive here, as elsewhere, with expensive care. 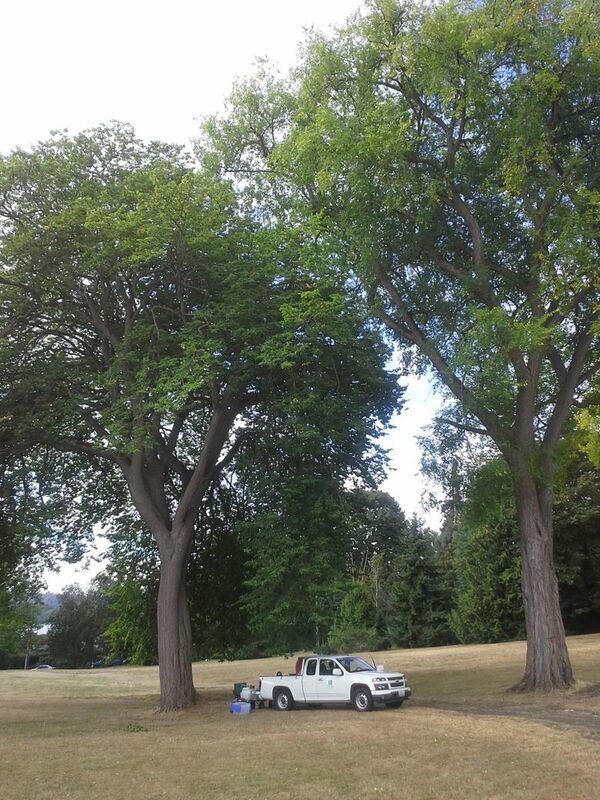 The elms at Martha Washington Park and other Seattle city parks are inoculated against the disease. But it is an imperfect defense. Elms still become infected by beetles that are the vector of the fungus. It can be passed by one elm to another even more than 100 feet apart because roots intertwine and even graft between trees, sharing nutrients, water — and the disease. There are today only a few other American elms in Seattle’s parks as large as the big elm that fell. The surviving mate in the pair measures 48.5 inches in diameter at breast height, 2.5 inches bigger than the fallen elm. There is only one American elm bigger, at Woodland Park. At 49 inches in diameter at breast height, it is the reigning champion of American elms in Seattle’s city parks by half an inch, in the city’s most recent estimates. The logs from the fallen elm will be auctioned off by the city, and some of the limbs will be used as landscaping features in the park. A few were on the ground on a recent visit, furry with moss and lichen. The wood smelled fruity, still fresh. Neighbors arrived, paying respects. And Bill Pickard came over from Leschi with what he hopes will be the tree’s replacement: a beautiful Garry oak sapling. He grew it himself, using an acorn from a tree nearby. Planting it would continue a long history here, where Garry oaks were once common, from Seward Park to Pritchard Island, said Tom Wolken, chairman of the Friends of Martha Washington Park. Today at the park, just a few Garry oaks remain. The heart of the park where the big elm grew deserves something as special as a hand-grown scion, from a species as old as the landscape, Wolken said. Planting another signature tree is something to look forward to, after the loss of the big elm. Wolken has lived a block away from the park for some 30 years, with its pair of elms a fulcrum for the seasons. There are other elms at the park. But the big elm’s mate at the center of it all now stands alone.